Financial institutions have strategically differentiated themselves from the competition based upon several factors: convenience, product offerings, rates and fees, and even service. A sustainable competitive advantage is normally determined by what makes each bank different, what they believe their core purpose is, how they plan to grow strategically. Depending on size and available resources, however, some differentiators are more easily attained than others. Looking at the competitive landscape also helps make this determination. Through the years, adding branches, products, services and staff have normally played a part in the typical growth plan to stay competitive. Also, to reduce costs and improve convenience, cheaper and less personal delivery channels such as online banking and mobile access were implemented. But with a larger infrastructure comes higher operating expenses. To keep a healthy bottom line, rates and fees started to become less attractive to customers. Growth has no doubt risen as fast as it has in part because of branch expansion, online services and changes in the competitive landscape. But have banks forgotten that exceptional customer service and convenience contribute to their overall competitive advantage? Is it too late to win back the hearts of customers and those who would refer us to others? Some banks offer the ultimate convenience for their customers – bringing the bank to them. Instead of going to their residences, however, most initiate a “Bank@Work” program. After first developing an agreement and partnership with local businesses, bank representatives take service to the next level by taking the “bank” to the company and scheduling on-site visits to serve their employees on a regular basis. Even with taking laptops to gather information about new accounts, to take loan applications or to demonstrate online services, this customer convenience comes with an internal cost. In most cases, since there’s no real-time connectivity back to the bank’s core system and other integrated applications, reps must manually re-enter all of the data into the live system after returning to their workstation. This is very time consuming, repetitive and costly. When’s the last time you visited your customers at their place of business? Have you discontinued your on-site visits and on-site financial education workshops? How about personal on-site company visits to serve them by appointment when it’s convenient for them? 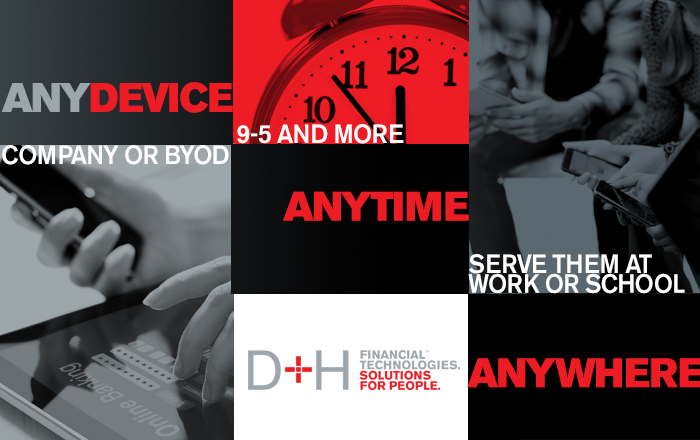 What if you could keep your service differentiator of the past while combining the technology of today? What if wherever you were, bank employees were connected with every software tool they would normally have access to at a branch? It’s possible in a cloud environment. No doubt you’ve heard a ton about the cloud. You may not fully understand it and probably have questions about how it’s used and whether or not it’s secure. Let’s first define what kind of cloud we’re discussing. There are many different types of clouds – public clouds, hosted or co-location services. We’re not discussing those. Instead, this cloud is a channel delivery solution, an enterprise computing platform, specifically designed for financial institutions. This is an online, fault-tolerant, physically secure datacenter that is highly scalable and fully manageable with all of the features you need built right in. Redundant, high-speed circuits connect to a geographically separate disaster recovery facility, including real-time replication of all data and applications. Simply put, it’s basically taking your bank – and all of its software tools – TO your customers – WHERE they work with a little help from technology. It’s as easy as taking your laptop or mobile device with you when you visit your customers – anywhere.